Fortunately, the produce aisle is not only full of healthy, fresh choices, but is also the easiest place in the store to avoid GMOs. Choose organic, and try to buy local produce to support a strong, sustainable regional economy and your local farmers. GMO corn and soy are common ingredients in feed for livestock. Look for Non-GMO Project Verified dairy, eggs, meat and fish for assurance that the animals have been fed a non-GMO diet. Choosing organic, grass-fed or wild-caught is a risk-reduction strategy when a verified option isn’t available. If you’re scooping from a bin in the bulk aisle, a lot of what you’ll find is unlikely to be genetically modified. Most beans, grains and spices are good to go, but if you need something like trail mix, granola, or soup mix, you’ll want to find a version without high-risk ingredients, or choose a Non-GMO Project Verified option. The products you find in boxes, cans and bottles in the center aisles of the store have the highest risk for containing GMOs. Corn, soy, canola and sugar beets show up on lots of ingredient panels, both in recognizable forms and also hiding in other, more processed ingredients. 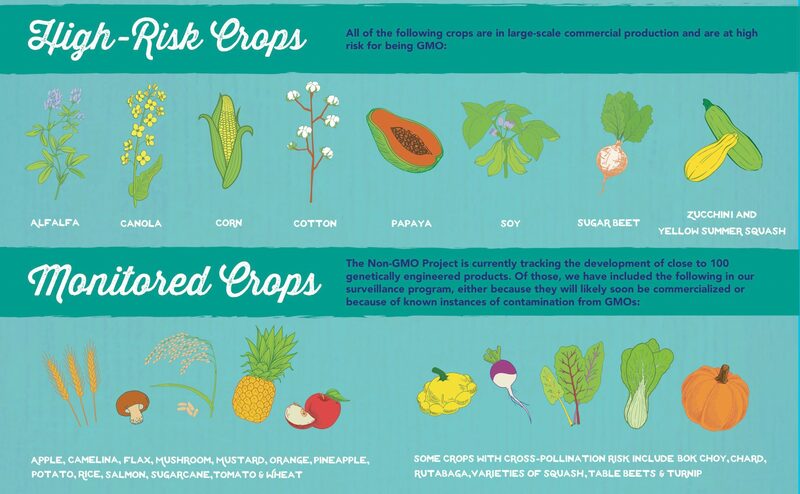 Your best bet with these types of foods is to look for the Non-GMO Project Verified label. For the gold standard in food quality and safety, look for products that also bear the organic label. Just like packaged foods, supplements often contain many additives that are highly processed corn and soy derivatives. The food-based vitamin and supplement industry is working hard to increase transparency in their ingredient sourcing, and there is a growing list of Non-GMO Project Verified choices. Buying local can help you steer clear of GMO foods. Not only are you supporting small farms and local vendors, you’re also more likely to choose foods that are consciously made, sourced, or grown by farmers and artisans who choose not to use GMOs. If you aren’t sure about whether the local product you’re interested in contains GMOs, just ask! Local vendors are often happy to talk with their customers about how their products are made or grown. To learn more about GMOs, read “Understanding GMOs” and “Most Common GMOs“. This entry was posted in Educational, Produce Page and tagged GMOs, Non-GMO Month, Non-GMO Project. Bookmark the permalink.